Forensic Science – using analytical and deductive reasoning strategies to examine facts and decide ‘whodunnit’! Each term, 30 children (10 x Year 1/2, 10 x Year 3/4 and 10 x Year 5/6 children) are participating in mathematical-based extension programs. In Term 3, another 30 children will participate in science-based extension programs. Whilst in Term 4, another 30 children will participate in an English-based extension program. These programs operate for one hour per week over eight weeks in the term and are taken by an experienced specialist teacher. The activities in the Term 2 Maths extension program are outlined below. exploration of shapes including properties, rules (Euler) and tests of existence. extending shape knowledge to problem solving, such as identifying shapes within shapes. finding paths on traversable networks or circuits. Look at cycling routes. exploring the concept of equality sign and use this to explore algebraic balances. developing logic ability through measurement (volume) activities. extensive investigation of graphs; including sector graphs, pictographs and straight line graphs. Construction of linear equations/graphs following an investigative practical project. extension of linear equations to include rates of flow and averages. exploring probability. Progress to rules for calculating probability. learning algebraic rules. Deducing rules from tabulated data. Pascal - use of his triangle to find combinations of given events. Pythagoras - explore his theorem and its use in everyday situations. eg. calculating the height of objects in the distance. Archimedes - explore the principle regarding the relationship between mass and displacement. Euler - explore Euler’s formula relating to 3D solids as well as network paths. Newton - explore first law. (Includes a practical investigation). Goldbach - investigate his conjecture. Investigate repeating cycles (doubling , trebling) Extend to cycling in indices. These programs involve students from year 1 to year 6 working in small groups with like-minded peers on a variety of ‘hands on’ projects. Students are selected and withdrawn from the classroom after being nominated by the classroom teacher. The programs run for a term and students are involved in sessions on a weekly basis. This year, the programs include Numeracy, Literacy and Philosophy. In the Numeracy program students work individually and in small groups to solve complex problems. Practical investigations are often carried out and students work together to learn more about mathematicians that have made significant contributions to our world. The Literacy program includes debating and students are involved in debating contemporary and controversial topics. Students learn to work in a small team to plan and prepare their views on a nominated topic. Students find it particularly challenging to argue a point of view that they may not necessarily believe themselves. In the Literacy program much time is devoted to extending the students’ ability to draw meaning from complex texts. Texts of varying lengths are explored and students are taught skills that assist them in finding the hidden clues buried within the text. The students become a group of formidable reading detectives! The Science Program has a high focus on practical investigations and students work in small groups to carry these out. Topics have included Solids, liquids and gases, Light, Energy and Matter. Students have the opportunity to learn how to use equipment that would not normally be part of a classroom program. Students learn how to hypothesise and explore their theories as well as to accurately record and report findings from a wide range of investigations. The Philosophy program is a new program that was introduced in 2010. The program is Literacy based where a picture narrative is shared with the group and then the issues raised are explored as a group through structured discussion. Students are encouraged to share their ideas with the group and to listen to and consider others views as they share. Some areas of exploration have included discrimination, good and evil, prettiness and happiness, stereotypes and values. Small group activities designed to stimulate discussion are also included in this program. The Literacy Support Programs involve small groups of students from year 1 to year 6 working with a specialist teacher several times each week. Students are withdrawn from the classroom, usually during the Literacy block and they work in a program designed to assist them to develop the skills necessary to become an accomplished reader and writer. The programs include a wide range of activities designed to improve the students’ phonemic awareness. Fun activities and games are designed to improve their ability to recognise and reproduce the sounds that occur in the words that they need to be able to successfully read and write. Some students require a small group environment to learn best and the Literacy Support groups are able to provide this. Guided reading sessions are an essential part of the program and the school-wide Write to Read (W2R) program is incorporated into the literacy support programs. Challenge Programs are run by parents or teachers and provide students with opportunities to participate in a variety of enrichment activities in which they have demonstrated skills and/or interests. 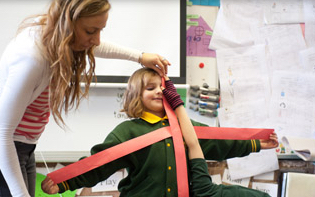 Each year, students in Year 1/2, Year 3/4 and Year 5/6participate in a variety of Challenge Programs. Oil Pastel Drawing - taught the children various techniques for effective drawing with oil pastels. Web Page Design - assisted the children through the process of creating their own web pages. Designing and Building - took the children through the process of designing and building a Mini-beast enclosure. Art (Colour) - taught the children about the impact of colour, including complementary and contrasting colours. Science (Space) - the children completed meteor experiment, created a space model and designed and made spacesuits. Science / Technology(Flight) – assisted the students to develop their understandings about air pressure and gravity by building and testing various ‘flying machines’. Performing Arts – the children participated in various drama activities designed to improve confidence and expose the children to the various elements of performance (scriptwriting, props, etc). Science / Technology – assisted students to design and build various items powered by water, wind and solar power. Mathematics - engaged the students in a variety of ‘hands on’ mathematical problem-solving activities exploring various mathematical strands (eg. number, space, measurement and reasoning & strategies). Card-Making – taught students a variety of card-making techniques, including: embossing, using stencils, stamping, using craft punches, decorative scissors, ribbons, etc. Woodwork - the children planned and built their own constructions, following set plans / diagrams to construct various objects. Photography– involved the students in a variety of activities aimed at improving their understanding of digital and film photography. Each year, Eltham North Primary enters teams consisting of Year 5 and 6students. A team (seven students) will be required to work together on along-term challenge for six weeks without assistance from teachers, parents or peers. They will be encouraged to explore possibilities and experiment with ideas as they endeavour to produce their best possible solution. They will develop a creative and original way to communicate this solution to others, working within predefined parameters such as limited materials, complex challenge criteria and the deadline of Tournament Day. Students will present the product of their ideas – their challenge solution – to a panel of judges and an audience on Tournament Day. They will have ten minutes in which to present and must do so within a 3 x 3 metre performance area. The teams must also participate in an unseen ‘spontaneous challenge’ on Tournament Day. This Challenge requires rapid interchange of ideas, the ability to think creatively and well developed group cooperation skills. The winning teams from all Victorian Regions, in each division of the challenge will be invited to participate in the State Final. The winning teams from the State Final will be invited to participate in the Australian Pacific Final where students compete against the other winning teams from all Australian states and territories, and teams from Singapore, Hong Kong and New Zealand. Is an independent organisation offering challenging, enriching activities and experiences to develop and extend highly able children. It is their aim to provide opportunities for children of 'like-minds' to participate in programs that will challenge them intellectually and help develop their individual talents. Here is a summary of the wonderful programs our children have participated in. During semester one 35 children from Eltham North Primary have participated in a variety of GateWays programs. ‘Flying High’, at Essendon airport introduced children to the wonderful world of aviation – including hands on flying in a plane and a simulator. ‘A New Space Odessey’ invited children to be part of a team in charge of a top-secret space project. ‘Go for Gold…Robolympics’ allowed the students to design and program robots to perform amazing feats. Further programs will be available next semester and hopefully many more Eltham North children will be able to participate in these challenging and enriching activities. THE GATEWAYS TEAM CHALLENGE: The GATEways Team Challenge extends children’s leadership and problem-solving abilities through a series of original, creative and exciting activities in four areas. Julie van Noorden GateWays coordinator. Tali is an early intervention app-based ipad/tablet program designed to help improve core attention skills and improve academic outcomes. Selective attention that helps with listening in class and helping to block out distractions. Focus to help improve school work. Control to aid in group work and understanding instructions. Inhibition to help the student to slow down and think before they do something. Each exercise is 4 minutes long and there is a game at the end as a reward, the program also uses sticker book as a reward. The program is completed once a day for 25 sessions. Other programs we have used at school include: Cogmed a working memory program which was used from prep to grade 6 and ACTIVATE that was to improve executive function and was used for students from grade 3 to 6. Children in the Tali program play learning based games on an iPad for 25 minutes a day to improve their concentration. It is targeted at children with learning difficulties such as autism and ADHD. Using screen Time in the program is a key feature in keeping the attention of the students. It is important we try to make sure the students have access to programs and apps that will help with their learning. To date, results indicate students making significant gains in their reading level due to their capacity to concentrate and focus on task. Children are selected for the program based on individual measures of assessment and teacher judgement. Their classroom literacy program is then supplemented with daily one-to-one lessons of thirty minutes. The program runs for twelve to twenty weeks with a specially trained teacher. The lessons consist of a variety of reading and writing experiences designed to help children develop effective reading and writing strategies. The program continues until the child can read within or above the class average and has demonstrated the use of independent reading and writing strategies. The remarkable progress made by children participating demonstrates that high percentages of at-risk students can achieve success. The key to success is intervention with specialised teaching that will enable students to improve quickly before they are labelled as failures. Essential to the success of the Program is the inservice training for early years teachers. These experienced early years literacy teachers participate in a year-long inservice program conducted by a trained Reading Recovery Tutor. The year-long program integrates theory and practice and is characterised by intensive interaction with colleagues. Following this training year, teachers continue their specialised professional development through ongoing interaction with their colleagues and instructors. Reading Recovery teachers in training become literacy specialists developing keen observational skills and a repertoire of intervention strategies that can be adapted to meet the individual needs of at-risk students. During the Reading Recovery lesson, students are involved in authentic reading and writing tasks. The Reading Recovery teacher demonstrates and teaches for problem-solving strategies and supports the student to develop effective reading and writing processing. Reading a new book that will be read independently the next day. The goal of the Reading Recovery Program is accelerated learning. Each student is expected to make faster-than-average progress so that he or she can catch up with other students in the class. Accelerated leaning is possible because Reading Recovery teachers base their instruction on carefully documented daily observations of what each student already knows about reading and writing. Instruction begins from the student’s strengths with the teacher not wasting time teaching anything that is already known. (Clay, 1993b). Students learn the strategies that good readers use when reading and writing. Students are closely observed in the classroom after their program ceases to ensure that they continue to use effective reading and writing strategies. After leaving the program, each student’s progress is monitored fortnightly by the Reading Recovery teacher for one term. Careful long term monitoring of the students then becomes the responsibility of the class teacher who takes regular Running Records of the student’s reading. Schools need to make contact with parents to explain Reading Recovery as something extra that the school is able to offer their child and to enlist their support. It is especially important for parents to be aware of the need for their child to attend school every day so they can receive daily instruction and that students take books home each night to read to their parents. Many parents respond positively to an invitation to observe lessons and to discuss their child’s literacy development. Tandy Johnston coordinates Year 1 - 6 science extension program consisting of8 x 1 hour sessions. Information Technology Computer Software, What’s Behind the Web Page? The Big Questions Students participate from 4:00pm to 6:00pm over four consecutive weeks. The Connections Programs run in Semester 1 and 2 each year. Many of our Year5 and 6 students participate in these programs. Participants in the Phonemic Awareness Program are Prep children who have been screened as having deficits in various phonemic awareness subskills, eg. identifying initial and end sounds in words, identifying and producing rhyming words, blending sounds together to form words, breaking up words by segmenting each of the sounds within the word and manipulating the sounds in words. The children participate in groups of 6 students. Phonemic awareness is the ability to hear and manipulate the sounds in words. Phonemic awareness has been shown to be the most important predictor of later reading achievement. Children need to be able to hear the sounds in words in order to ‘sound out’ words when reading and spell words accurately when they write. The children participate in a variety of fun activities and games to promote their phonemic awareness and letter-sound knowledge. Reading Recovery is an intensive one-on-one reading intervention program. Two students receive an individual ½ hour lesson each day. Children receive a maximum of 20 weeks instruction (although most students require significantly less than this). Children receive specific instruction in using the three cueing systems effectively. The child’s progress is carefully monitored (running records are completed daily) and the child’s parents are expected to complete the follow-up reading with their child each day. After the children make significant progress with their reading, they are discontinued from Reading Recovery and another child enters the program. Participants in this program have been identified as experiencing literacy difficulties in reading and/or writing. Children work in groups of up to 6 students and receive 3 x 50-minute sessions per week. The Prep - Year 2 Literacy Support Program includes the following types of activities: Phonemic awareness activities: (identifying and producing rhyming words, blending sounds together to form words, segmenting a word into its component sounds, and manipulating the sounds within a word), Guided & Shared Reading, Sight Vocabulary activities (using M100W words), Word Attack activities (using the W2R phonograms) and Writing activities (guided writing and dictation). Some children receive support in the Year 1 Literacy Support Programs before and/or after receiving Reading Recovery. Participants in this program have been identified as experiencing literacy difficulties in reading and/or writing. Children work in groups of up to 6 students and receive 2 x 50-minute sessions per week. These sessions include the following types of activities: recognising and writing the phonograms (Write to Read), learning Write to Read rules and their application, guided and shared reading, reading comprehension activities (using CARS/STARS resources), activities reinforcing correct grammar & punctuation and exploring different writing genres. Students will sometimes work in small groups to receive support in Write to Read sessions (Years 3 - 6) or in Literacy Circles activities or Writer’s Notebook activities (Years 5 & 6). Participants in the program have been assessed as having difficulties in either expressive language, receptive language or in both areas. The children either work in a small group program (3-4 children) or an individual program and attend 1 x one hour session per week for 8 weeks each term with Meredith Potts (Speech and Language Pathologist). The receptive language groups focus on the child’s ability to understand and process information presented to them in speech or writing. This includes, for example, the ability to follow directions, to understand the meaning of words and the relationship between them, to remember what they’ve been told and to make sense of stories that they read and hear. The expressive language groups focus on the child’s ability to orally express themselves. This includes the ability to use a range of words appropriate to the situation, to tell a story in the right order and with sufficient detail, and to understand and use correct grammar and sentence formation. Participants in this program have been assessed as experiencing ‘decoding’ difficulties in reading. The children work in groups of up to 6 students and attend 4 x 50 minute sessions per week. 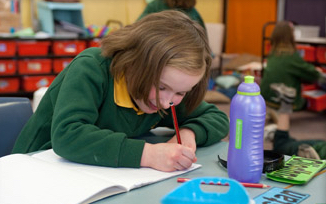 The Corrective Reading Program gives Direct Instruction in basic reading skills and involves “intensive, carefully sequenced, teacher-directed and small group instruction.” The Corrective Reading Program approach involves teaching decoding skills, enabling struggling readers to develop and utilise phonics skills. Each lesson involves: word study (and looking at how words are spelt), group and individual reading of passages that contain words from the word study section, and comprehension activities based on the reading passage. Maths Support Program (Year 3/4 and Year 5/6). Participants in the Maths Support Program have been identified as experiencing various difficulties in their mathematical skills and understandings. Students experiencing similar difficulties are then grouped together in a Maths Support Program. The children work in groups of 6 and receive 4 x 50 minute sessions per week during the class’ Numeracy block. Each session involves lots of ‘hands on’ work and concrete materials are used extensively (e.g. number charts, bead frames, counters, Numicon, M.A.B., place value charts, calculators, etc). The main focus of these sessions is on developing improved understandings in Number (especially counting, pattern & order, place value, and the four operations), although other strands are also incorporated. Participants in this program have been identified as having difficulties with their auditory working memory, visual working memory or both. Students attend a 50-minute session every day for 5 weeks. During the session, students use the ipad to complete 8 different activities designed to train the child’s working memory ability. The students are supervised by a trained Cogmed Coach - who provides feedback and support to the students during the sessions. At the completion of the program, the students are reassessed on the working memory assessments completed before commencing the program to assess their progress. A written report is provided and a follow up meeting held with the child’s parents. Participants in this program have been identified as having difficulties with their executive functioning. Students attend a 50-minute session every day for 8 weeks. During the session, students use the ipad to complete different activities designed to train various executive functioning skills, such as sustained attention, working memory, processing speed, pattern formation and cognitive flexibility. The students are supervised by a trained coach, who provides feedback and support to the students during the sessions. At the completion of the program, the students’ executive functioning skills are reassessed to determine their progress. A written report is provided and a follow up meeting held with the child’s parents. Participants in these sessions have been assessed as having difficulties with their articulation (production of speech sounds) or their expressive and/or receptive language. The children either work in a small group program (up to 3-4 children) or an individual program and attend 1 x 50 minute session per week for 8 weeks each term with Renee Bell (Speech and Language Pathologist). The receptive language groups focus on the child’s ability to understand and process information presented to them in speech or writing (including the ability to follow directions, to understand the meaning of words and the relationship between them, to remember what they’ve been told and to make sense of stories that they read and hear). The expressive language groups focus on the child’s ability to orally express themselves (including the ability to use a range of words appropriate to the situation, to tell a story in the right order and with sufficient detail, and to understand and use correct grammar and sentence formation). Participants in this program have been assessed by Danni La Ferlita (paediatric occupational therapist) as having difficulties with fine motor skills (eg. handwriting), gross motor skills (running, throwing, catching), sensory issues or emotional regulation skills. The students participate in an individual weekly 50-minute session. Regular communication between the occupational therapist and the class teacher and parents is encouraged to ensure that the therapy can be followed up at school and /or in the classroom. Students discontinue occupational therapy after significant progress has been made and in consultation with parents and teachers. Become easily distracted when doing something not highly interesting? Have trouble waiting his/her turn? Struggle with reading comprehension or doing maths calculations in his/her head? Struggle with getting started or with completing a task? Have difficulties when planning and organising something with multiple steps? Often seem restless and on the go? If you answered ‘yes’ to most of these questions, it is possible that you child may have difficulties with their ‘working memory’. Working memory is a system for temporary storage and manipulation of information, necessary for a wide range of cognitive tasks. It is the ability to keep information in your mind for a short period of time (seconds) and be able to use the information in your thinking. The results of the students who have participated in Cogmed have been outstanding. As such, we are offering the program again this year. As the program is quite costly and also requires a staff member to supervise and support their progress, there is a fee for those that are selected to participate. However, the cost is significantly less than the cost of accessing the program privately. If you feel that this program could be of benefit to your child and would like to register your interest, please contact the office via email (through Compass). Before any decisions are made, a comprehensive screening process would be completed to ensure that the program is offered to suitable candidates.